To activate your Cambridge GO account, you must be connected to the internet using a browser such as Internet Explorer 9 or above, Firefox, Safari or Google Chrome. Some material on Cambridge GO can be downloaded, including PDF Textbooks and Electronic Workbooks. All Interactive Textbook materials published from 2013 onwards are compatible with iPad and other devices using iOS. Selected materials in earlier Interactive Textbooks use Adobe Flash and are not compatible with these devices. The PDF Textbook and Electronic Workbook are designed for full functionality using the latest version of Adobe Reader. The markup function is available in selected PDF readers for the iPad and other devices using iOS. Check your PDF reader specifications. At the time of publishing Good Reader and PDF Expert were compatible options. The Electronic Version can be read in any PDF reader. To input answers you will need to install an app that allows markup of the PDF document. Check the app description before downloading. At the time of printing PDF Expert was one compatible option. Setting up a Cambridge GO account is free of charge. Make sure you validate your account by clicking on the link in the email we will send to your registered email address. *Note: if you have purchased an Essential Mathematics for the AC Second Edition, Cambridge Senior Mathematics, Cambridge Dynamic Science or Cambridge HOTMaths product see Section D: Activating your Cambridge maths product powered by Cambridge HOTmaths. If you have purchased a print textbook with an access code printed in the front inside cover or a digital-only product supplied in a sealed pocket or via email, activate your product using the following steps. Click on the LOGIN button in the top right hand corner of the screen and login in using the username and password you created when you registered for your account. After login you will arrive at the MY RESOURCES page. All of your resources can be accessed here. 4. Click on the green ACTIVATE button that appears above your name on the left side of your MY RESOURCES page. 5. Enter the unique 16-character access code from the inside front cover of your textbook, or provided in a sealed pocket or via email. 6. Once you have ACTIVATED your product, it will appear on your MY RESOURCES page where all of your Cambridge GO resources will be housed. 7. Each resource linked to your product (e.g. Interactive Textbook and PDF Textbook) can be launched by clicking on the resource launcher icons on the right of the screen. Click on the JOIN NOW button in the top right. Follow the prompts on the series portal to set up your account and activate your product using the access code supplied. Once you have activated your product, you can continue to access your resources through the series portal, or you can connect to these resources through Cambridge GO. Once you have created your account and activated your product access code through the series portal, you can choose to CONNECT to your product through your Cambridge GO account so that you can access all of your Cambridge resources through the one account. You only need to CONNECT to your product through Cambridge GO once and it will then appear on your MY RESOURCES page. Make sure you have activated your product through the series portal (see above). 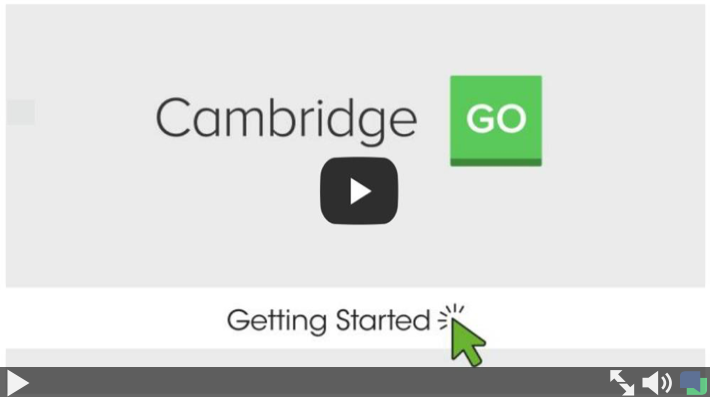 Click on the CONNECT button on your Cambridge GO MY RESOURCES page. 3. Select the product to which would like to connect, and enter the username and password you created when you set up your account through the series portal. Note: this need not be the same username and password you have used for your Cambridge GO account. Activating additional levels or courses of your powered by Cambridge HOTmaths, Cambridge HOTmaths or Dynamic Science product. Follow the prompts to activate a new product. Once you have activated additional products, you can move between these via the dropdown menu in the navigation bar of your resource. Your MY RESOURCES page houses all of your Cambridge GO digital resources. Your product will appear on the left of the MY RESOURCES page. Click on View All Resources to see the resources currently available with your subscription. Access a resource by clicking on the relevant launcher icon on the right. To view all resources associated with a title, including those you have currently do not have access to, click on the title name that appears directly to the right of the cover image. Purchase the relevant product access code. Click the ACTIVATE button and enter the unique access code for that product. For instance, if a teacher has activated a product code for the Teacher Resource Package, but would like to access student resources not included in this package, the teacher would need to purchase and activate a product access code that includes these resources. Where can I purchase a product access code? You can purchase a product access code from your Education Bookseller. The access codes are available with the printed textbook for most titles or are available separately as a digital-only product. Access codes may also be purchased online at www.cambridge.edu.au/education. Digital-only products will be emailed to you immediately. Click on the LOGIN button in the top right. Enter your email address and click Reset my password. A new password will be sent immediately to the the email address you supplied on sign up. Use this new password to LOGIN to your account. You can change your password, name, school and privacy settings at any time. Click on Edit Details to change your contact details and privacy settings. Make sure you save your changes. What do I do if I’ve lost / did not receive my account activation email and would like to activate my account? What do I do if my code won’t activate? Error: This code has already been activated. Please contact customer service as your code is active on an account. Error: Access code not found. Please check you have entered the correct 16-characters. Also remember all Cambridge Senior Mathematics, Essential Mathematics for the Australian Curriculum Second Edition, Cambridge HOTmaths and Cambridge Dynamic Science products must be activated via the series portal page. See Section D for further information. Please email us at [email protected] or call 1800 005 210. How do I access the PDF Textbook or Electronic Workbook on an iPad? Open Safari on your iPad or any other Internet browser you prefer. Ensure you have a PDF reader on your iPad at this time. iBooks, Adobe Reader or Good Reader for iPad are options available in the App store. Login to your Cambridge GO Account using your username and password. If you have already activated your product, it will appear on your My Resources page when you login. If you have not activated your product access code, refer to Section C: Activating your Cambridge products through Cambridge GO for more information. On your My Resources page, click on the PDF Textbook resource launcher icon on the right. Select the chapter required and download to your reader (ie. iBooks). You may also elect to download the complete PDF Textbook. The PDF Textbook is a downloadable version of the student text, with note-taking and bookmarking enabled. The PDF Textbook can be used in class or as a reference at home. To use the features of the PDF Textbook, it must be downloaded to your computer or mobile device and opened in a PDF reader, such as Acrobat 9 Reader or PDF Expert. Access to the PDF Textbook is included with the purchase of the printed student text and the Interactive Textbook. It is downloaded from Cambridge GO using the unique 16-character code found in the front of the printed textbook. The code will be provided in a sealed pocket or via email from your bookseller, or sent via email if purchased online. Access is provided to the PDF Textbook and Cambridge GO ancillary material through Cambridge GO for 500 days from the date of activation. You are entitled to download and store PDF Textbooks on your local machine. However, they may not be transferred to another party as an electronic or print version. The downloaded PDF Textbook is expressly available for personal use only. Schools are entitled to load the downloaded PDFs onto their school network for use only for the same number of users as they have purchased printed or digital texts. The Electronic Version is available for purchase separately and is from Cambridge GO using the unique 16-character code provided in a sealed pocket or via email from your bookseller, or sent via email if purchased online. The licence granted for your use of the Electronic Versions on Cambridge GO is limited to access for one calendar year* unless otherwise stated on resources that have been designed to cover multiple year levels. An access code cannot be activated concurrently by multiple users. * A calendar-year subscription is defined as follows: if activation occurs between January and July of this year, subscription concludes on the 31 December this year. If activation occurs between August and December of this year, subscription concludes on 31 December the following year. You are entitled to download and store Electronic Versions on your local machine. However, they may not be transferred to another party as an electronic or print version. The downloaded Electronic Version is expressly available for personal use only. The Interactive Textbook is an online version of the student text optimised to be read on screen through an internet browser. It delivers a host of interactive features to enhance the teaching and learning experience of the student text. The Interactive Textbook is best viewed in Firefox, Chrome or Safari. The Interactive Textbook is included with the printed text, or is available for purchase separately as a digital-only option. The unique 16-character access code is found in the front of the printed textbook. If purchased as a digital-only option, the code is provided in a sealed pocket or via email from your bookseller, or sent via email if purchased online. Interactive textbooks and some digital online resources are only available as online content. There are features to bookmark, make notes, and email and/or print single pages. Schools are only entitled to project this content onto classroom whiteboards only if the interactive textbook or online resource has been purchased for the number of students using it in the classroom. It is expressly not available for use in this way if it has been purchased as a reference copy rather than a class set or booklisted item. The Interactive Textbook, powered by Cambridge HOTmaths, is an online version of the student text optimised to be read on screen through an internet browser. It provides effortless and immediate access to a host of interactive features to enhance the teaching and learning experience of the student text. Used with the Online Teaching Suite, the Interactive Textbook enables teachers to monitor student progress through the learning management system and use the reporting function. The Interactive Textbook is best viewed in Firefox, Chrome or Safari. The Interactive Textbook powered by HOTmaths is included with the printed text, or is available for purchase separately as a digital-only option. The unique 16-character access code is found in the front of the printed textbook. If purchased as a digital-only option, the code is provided in a sealed pocket or via email from your bookseller, or sent via email if purchased online. To access the Interactive Textbook powered by HOTmaths, students will need to create an account on the series portal page for that product. Schools are entitled to project this content onto classroom whiteboards only if the interactive textbook or online resource has been purchased for the number of students using it in the classroom. It is expressly not available for use in this way if it has been purchased as a reference copy rather than a class set or booklisted item. The Teacher Resource Package offers valuable timesaving planning, classroom and assessment support resources for teachers. Most of these resources are available as downloadable materials that can be modified as required. The Teacher Resource Package is available for purchase separately online at www.cambridge.edu.au/education and will be emailed to you. To access the Teacher Resource Package, you must register for a Cambridge GO teacher account. Once your teacher account has been verified, enter the unique 16-character code found in the sealed pocket supplied on purchase or inside selected Print Teacher Resources. Note: The Teacher Resource Package does not include access to the PDF Textbook. To access the PDF Textbook, activate the unique16-character code found in your copy of the Print Textbook (or sealed pocket if you have purchased a digital-only teacher copy) in your Cambridge GO teacher account. The Teacher Resource Package is available through Cambridge GO for 5 years from activation. Other teachers at your school may place materials that can be downloaded on your school network for use. If the Teacher Resource Package includes non-downloadable resources, the sealed pocket will include additional codes for activation by colleagues in their own verified Cambridge GO teacher accounts.